The Bouvier des Flandres is a herding dog breed that originated in the Flanders area of Belgium. Bouvier des Flandres literally means "Herdsman of Flanders". They are used for general farm work including cattle droving, sheep herding, cart pulling, and as guard dogs, police dogs, and security dogs, as well as being kept as pets. It can be noted that usage of the French name is contradictory with the Flemish origin of the breed; in Flemish, they are known as Koehond or cattle dog. Bouviers are rarely used for pulling carts or for cattle droving or sheep herding any more. Today they are manily guard dogs or family pets with guardian as a sideline, duties for which their natural stability and good sense make them well suited. 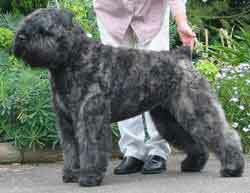 The shaggy, rough outer coat comes in fawn, black or grey brindle. It is lined with a thick, dense undercoat. Bouviers are large dogs with the males weighing 75 to 90 pounds and are 24-28 inches tall at the withers. The slightly smaller females weigh 60 to 80 pounds and stand 22-27 inches.